Last year, we had about a dozen people — parents with children — attend our Family Coding Night for the Hour of Code. Last night, more than 30 signed up and nearly double that number showed up, including a troop of Girl Scouts whose young members worked to earn coding badges. We had first grader students right through sixth graders in the room, with moms and dads in tow. 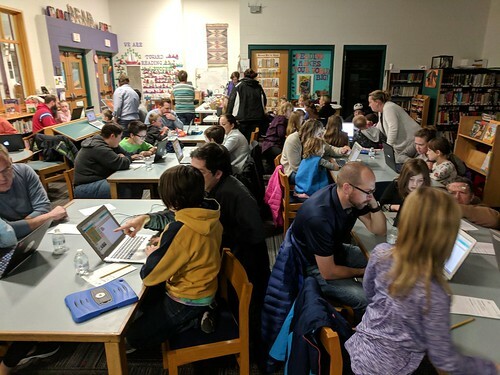 Our school library could barely contain the large number of parents and students who arrived to learn more about the Hour of Code — it seemed we kept bringing in new chairs and clearing off more table space — and to spend an hour doing logic puzzles and dipping into the basics of programming. We prefaced the night with discussions about what programming is, what coding looks like, the influence of technology on many aspects of our lives, the potential job markets on the horizon, and the magic of collaborative work. It was interesting, assisting folks and watching team of adults and children work together, talk through the puzzle challenges, wonder about how to get a character to work on the screen. It was those conversations that the real learning took place, and between the assorted and rather random fist-pumping “whoops” of success, the school district technology coordinator – Kim, who planned the event — and I wandered about, checking in. The hour ended, and we awarded certificates for the night, and encouraged families to keep the conversations going at home, either with the Hour of Code or in some other fashion. 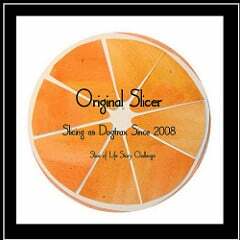 This entry was posted in Hour of Code, Slice of Life. Bookmark the permalink. What a great idea! There seems to always be such tension between parents and kids in technology – this brings them together in a positive collaborative way. Thanks for sharing. I think it’s fantastic you offered something for parents and students. How fun! Any time we can help parents and students find activities to do together .